Abstract An investigation into the future development of robots and robotics is conducted. After a brief discussion on the historical and current development of physical robots or earlier industrial robots, we focus on software robots, knowledge robots, parallel robots, and related issues in the corresponding fields of robotics. Clearly, after having been played an important role in industrial automation, robots or robotics will be a critical factor in the coming revolution of knowledge automation and a great attention must be paid to software, knowledge, and parallel robots and robotics for the success of intelligent industries. Hollerbach J, Mason M, Christensen H. A roadmap for US robotics: from internet to robotics[J]. Computing Community Consortium (CCC), Tech. Rep, 2009. 刘金国, 张学宾, 曲艳丽. 欧盟 “SPARC” 机器人研发计划解析[J]. 机器人技术与应用, 2015(2): 24-29. Liu Jinguo, Zhang Xuebin, Qu Yanli. Analysis on the development plan of the European Union "SPARC" robot[J]. Robot Technique and Application, 2015(2): 24-29. Fensom A. Japan’s robot revolution: As the nation grapples with a shrinking workforce, are robots the solution?[EB/OL]. 2015-07-10. http: thediplomat.com/2015/07/japans-robot-revolution/. 中国电子学会, 迈向机器人时代的中国选择[M]. 北京: 中国科学技术出版社, 2015. The Chinese electronic society. Towards the robot era-China,s choice[M]. 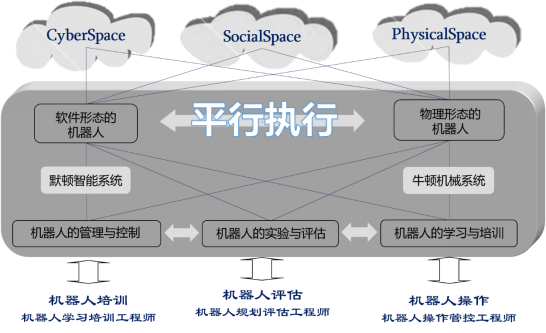 China Science and Technology Press, 2015. 王飞跃. 机器人如何大跃进？[M]. 财经, 2015(2): 48-49. Wang F Y. How could robots have a Great Leap Forward in China?[M]. Caijing, 2015(2): 48-49. 王飞跃, 知识机器人与工业5.0：迎接智能机的时代, 2015年国家机器人发展论坛, 北京, 2015. 04. [R/OL]. 2015-04-12. http://www.kongzhi.net/news/ndetail.php?p=153503. Wang F Y. 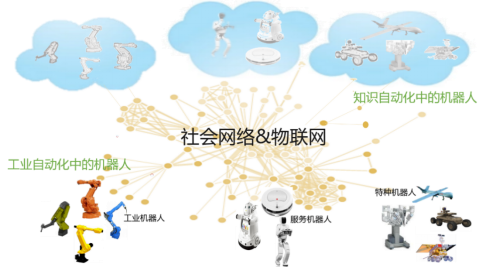 Knowledge Robots and Industries 5.0: Embracing the Era of intelligent machine, China National Robotics Development Forum 2015, Beijing, 2015.04. Sabanovic S, Milojevic S, Asaro P, et al. Robotics narratives and networks [J]. Robotics & Automation Magazine, IEEE, 2015, 22(1): 137-146. 谭民, 王硕. 机器人技术研究进展[J]. 自动化学报, 2013, 39(7): 963-972. Tan M, Wang S. Research progress on robotics[J]. Acta Automatica Sinica, 2013, 39(7): 963-972. Nikhar S, Shahare A. Need to develop robot for electronics warfare - A review[J]. International Journal of Mechanical Engineering and Robotics Research, 2014, 3(2): 359. Zhan Y, Duan X, Li J. Review of comanipulation robot in surgery[C]//2015 IEEE International Conference on Mechatronics and Automation (ICMA). IEEE, 2015: 1466-1471. Kruse T, Pandey A K, Alami R, et al. Human-aware robot navigation: A survey[J]. Robotics & Autonomous Systems, 2013, 61(12): 1726-1743. Tadele T S, De Vries T, Stramigioli S. The safety of domestic robotics: A survey of various safety-related publications[J]. IEEE Robotics & Automation Magazine, 2014, 21(3):134-142. Vanderborght B, Albu-Schaeffer A, Bicchi A, et al. Variable impedance actuators: A review[J]. Robotics & Autonomous Systems, 2013, 61(12): 1601-1614. Chang T K, Spowage A, Chan K Y. Review of control and sensor system of flexible manipulator[J]. Journal of Intelligent & Robotic Systems, 2015, 77(1): 187-213. Gao Y Q, Wang F Y, Xiao Z Q. Flexible manipulators: Modeling, analysis and optimum design[M]. Pittsburgh: Academic Press, 2012. Wang F Y and Gao Y Q. Advanced studies in flexible robotic manipulators: Modeling, design,control and application[M]. Singapore: World Scientific Publishing Company., 2003. Ivan I, Hwang G, Agnus J, et al. NIST and IEEE Challenge for MagPieR: The fastest mobile microrobots in the world[J]. IEEE Robotics & Automation Magazine, 2013, 20(2): 63-70. Ciuti G, Menciassi A, Dario P. Capsule endoscopy: from current achievements to open challenges[J]. IEEE Reviews in Biomedical Engineering, 2011, 4: 59-72. Shao L, Wang Y, Guo B, et al. A review over state of the art of in-pipe robot[C]//2015 IEEE International Conference on Mechatronics and Automation (ICMA). IEEE, 2015: 2180-2185. Shukla A, Karki H. A review of robotics in onshore oil-gas industry[C]//2013 IEEE International Conference on Mechatronics and Automation (ICMA). IEEE, 2013: 1153-1160. Erico Guizzo, "How Google's Self Driving Car Works", IEEE Spectrum, October 2011, http://spectrum.ieee.org/automaton/robotics/ artificialintelligence/how-google-self-driving-car-works. Sankar V. Review on adaptive cruise control in automobiles[J]. International Journal of Mechanical Engineering and Robotics Research, 2014, 3(2): 404. Malagon-Soldara S M, Toledano-Ayala M, Soto-Zarazua G, et al. Mobile robot localization: A review of probabilistic map-based techniques[J]. IAES International Journal of Robotics and Automation (IJRA), 2015, 4(1): 73-81. Hidalgo F, Braunl T. Review of underwater SLAM techniques[C]//2015 6th International Conference on Automation, Robotics and Applications (ICARA). IEEE, 2015: 306-311. Nagla K S, Uddin M, Singh D. Multisensor data fusion and integration for mobile robots: A review[J]. 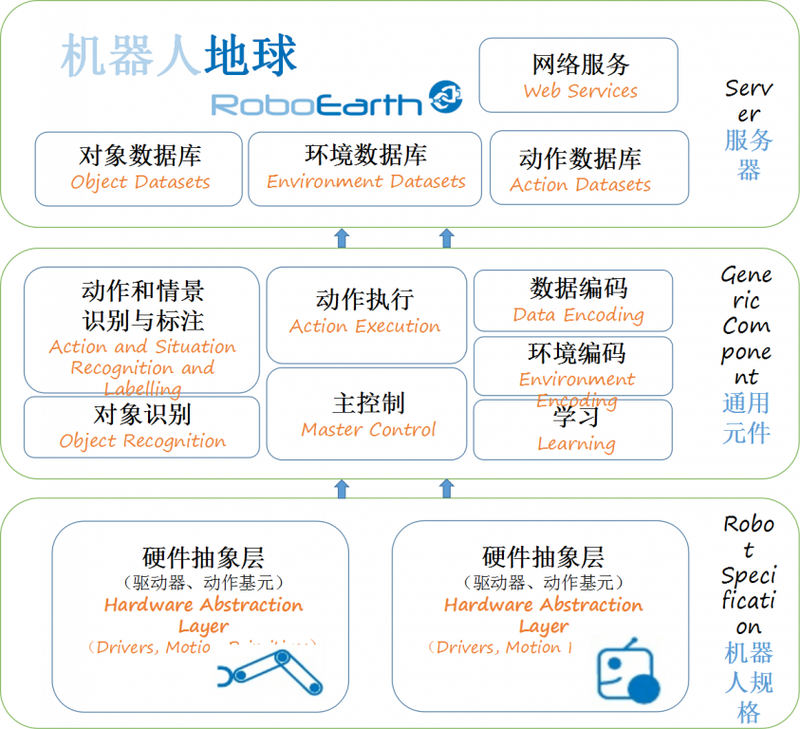 IAES International Journal of Robotics and Automation (IJRA), 2014, 3(2): 131-138. Bohg J, Morales A, Asfour T, et al. Data-driven grasp synthesis: A survey[J]. IEEE Transactions on Robotics, 2014, 30(2): 289-309. Alatartsev S, Stellmacher S, Ortmeier F. Robotic task sequencing problem: A survey[J]. Journal of Intelligent & Robotic Systems, 2015, 80: 279–298. Wang F Y, Gildea K, Jungnitz H, et al. Protocol design and performance analysis for manufacturing message specification: A Petri net approach[J]. IEEE Transactions on Industrial Electronics, 1995, 41(6): 641-653. Wang F Y, Gildea K, Rubenstein A. A colored petri net model for connection management services in MMS[J]. ACM SIGCOMM Computer Communication Review, 1989, 19(3): 76-98. 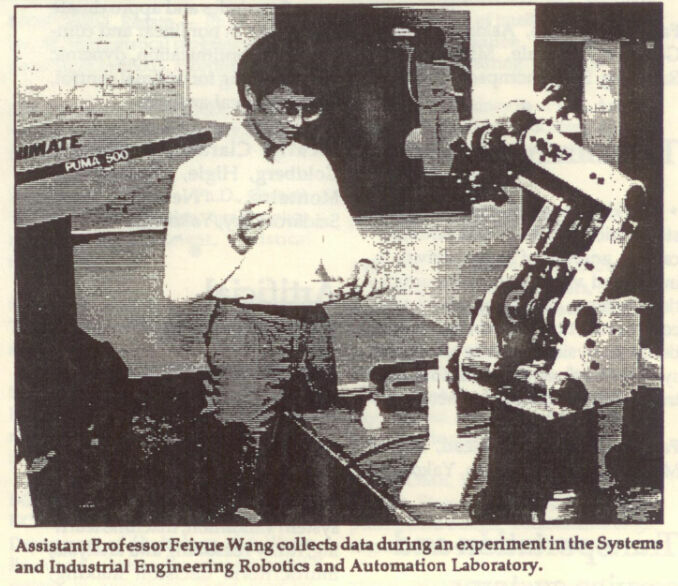 Ed Stiles, High School Students Control Robots from Internet on Open Labs Day, SIE News, University of Arizona, Tucson, AZ, 1992. K Goldberg, M Mascha, Beyond the web: Excavating the real world via mosaic[C].//Second International Conference on WWW. Chicago, Illinois, 1994. Inaba M. Remote-brained robots[C].// Proceedings of the Fifteenth International Joint Conference on Artificial Intelligence, IJCAI 97, Nagoya, Japan, August 23-29, 1997. Waibel M, Beetz M, Civera J, et al. A world wide web for robots[J]. IEEE Robotics & Automation Magazine, 2011, 18(2): 69-82. Kehoe B, Patil S, Abbeel P, et al. A survey of research on cloud robotics and automation[J]. IEEE Transactions on Automation Science and Engineering, 2015, 12(2): 398-409. Kuffner J J. Cloud-enabled robots[C]//IEEE-RAS International Conference on Humanoid Robotics, Nashville, TN. 2010. 王飞跃, 万维空间上的智能自动化: 从社会计算到网间机器人, 2011控制与自动化学术论坛, 香港, 2011.10. Wang F Y. Intelligence automation in Cyberspace: From social computing to web surrogates, Control and Automation Academic Forum 2011, HongKong, 2011.10. Wang F Y. Back to the Future: Surrogates, Mirror Worlds, and Parallel Universes[J]. IEEE Intelligent Systems, 2011(1): 2-4. Wang F Y. Newton vs Merton: From Physical Robots to Web Surrogates..IEEE International Conference on Robotics and Automation (ICRA) Shanghai, 2011.05. 王飞跃, “社会信号处理与分析的基本架”从社会传感网络到计算辩证解析方法[J]. 中国科学: 信息科学, 2013, 43(12): 1598-1611. WANG F Y. A framework for social signal processing and analysis: from social sensing networks to computational dialectical analytics[J]. Scientia Sinica Information, 2013, 43(12): 1598-1611. Wang F Y. Parallel robots: From industrial automation to knowledge automation, China National Robot Technology and Development Forum 2015. Guiyang, 2015.10.